Showing 5 digits number on spike abacus helps the children to understand the concept of numbers. 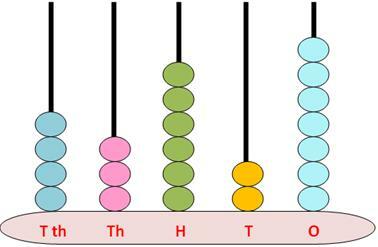 Numbers from 10000 to 99999 are 5 digits number; we can use beads to show these numbers on spike abacus. In ones or unit place there is no beads that represents 0; in tens place also there is no bead that represents 0; in hundreds place also there is no bead that represents 0; in thousands place also there is no bead that represents 0 and in ten thousands place there is only one bead that represents 1. 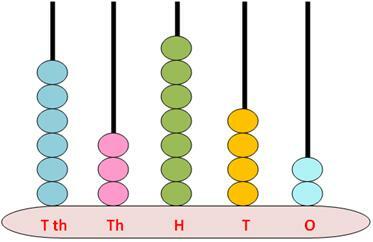 In ones or unit place there are seven beads that represents 7; in tens place there are two beads that represents 2; in hundreds place there are six beads that represents 6; in thousands place there are three beads that represents 3 and in ten thousands place there are four beads that represents 4. 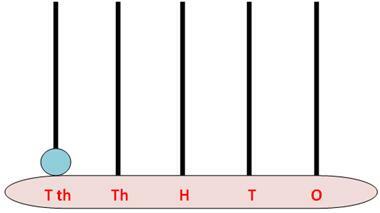 In ones or unit place there are two beads that represents 2; in tens place there are four beads that represents 4; in hundreds place there are seven beads that represents 7; in thousands place there are three beads that represents 3 and in ten thousands place there are six beads that represents 6.